IE7: Cloning of form-elements and changing their names also changes the name of the elements that are cloned. If the name-attribute first is accessed through the attr()-function before the element is cloned the element which is cloned also gets its name changed when the name of the cloned element is changed. Thanks for providing this test case, though it's not clear to me that anything unexpected is occurring. I'm viewing the test case in Chrome - is your issue browser specific? I can reproduce it only in IE7. I have also tested it with Firefox, Chrome, IE8 and IE9, in those browsers it works fine. 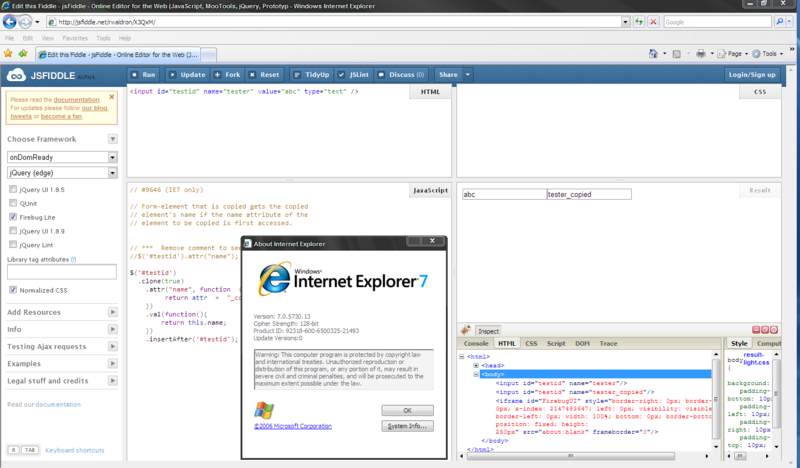 I now also tested it with jQuery 1.5.2 and with that version it also works fine in IE7 so this is a 1.6.x - specific bug. It doesn't seem to be related to the id and name being the same, as the reduced test case shows. Also strange that it *doesn't* fail in IE6, only IE7. EDIT: I foolishly missed the part about uncommenting a piece of code that was meant to reproduce the bug. Silly me. Did you remember to uncomment the line that access the element's name-attribute? Ugh... why would you write a test that isn't _just_ runnable? IE7: Cloning of form-elements and hanging their names also changes the name of the elements that are cloned. → IE7: Cloning of form-elements and changing their names also changes the name of the elements that are cloned. Here is a workaround if someone stumbles on this bug. It overwrites the attr-function with a version that checks if the browser is MSIE7 (or older version) and then directly gets the name attribute from the DOM-element. Fix #9646. Cloned nodes shouldn't affect original in IE7. Close gh-947.